We offer a variety of accommodation ranging from family suites to deluxe double rooms. 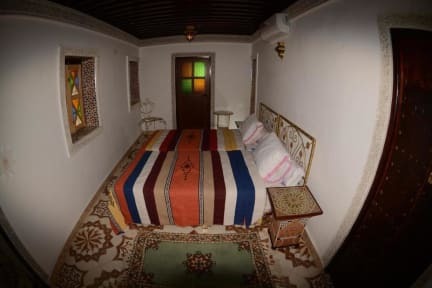 Many of our rooms are equipped with ensuite bathrooms, and all are decorated in the traditional Moroccan style by highly skilled local craftsmen. Located in the Medina, we are within walking distance of a vast array of shops and cooperatives selling local handicrafts, including bronze casting, Berber carpets and leather crafts. 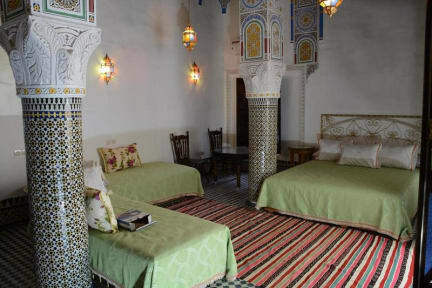 Our terrace provides stunning views of the old medina, and the riad is within close proximety to many of Fes's top attractions, including the medina's oldest and largest tannery, and the world's oldest university. We also have a restaurant in the riad serving delicious traditional Moroccan foods, open to guests for breakfast, lunch and dinner.